Description — 4° (30 x 21.5 x 2 cm), 140 p., clothbound, pict. dj, slipcase, full-page/spread b&w pictures (gravure), 5 illustrations (maps), illustrated chronological chart. Postfaces by Zheng Zhenduo and YOSHIKAWA Kojiro, in Japanese. Photo index in both Japanese and English, presentation in English. Laid in: photo index [jp], price tag. État / Condition — Excellent (light wear to slipcase back). 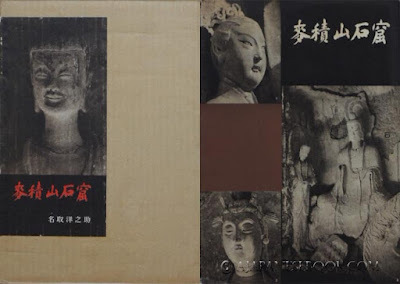 Remarques & avis / Review — A stunning depiction of the Maijishan Grottoes in China and their Buddhist art, in heavily contrasted monochrome pictures and outstanding gravure, by NATORI Yonosuke. Rare in good condition.